I recently moved country and had to leave my players behind. Luckily, one of them took up the mantle of DM and the adventure continues. But I couldn’t leave them to play with bottle caps and markers, now, could I? 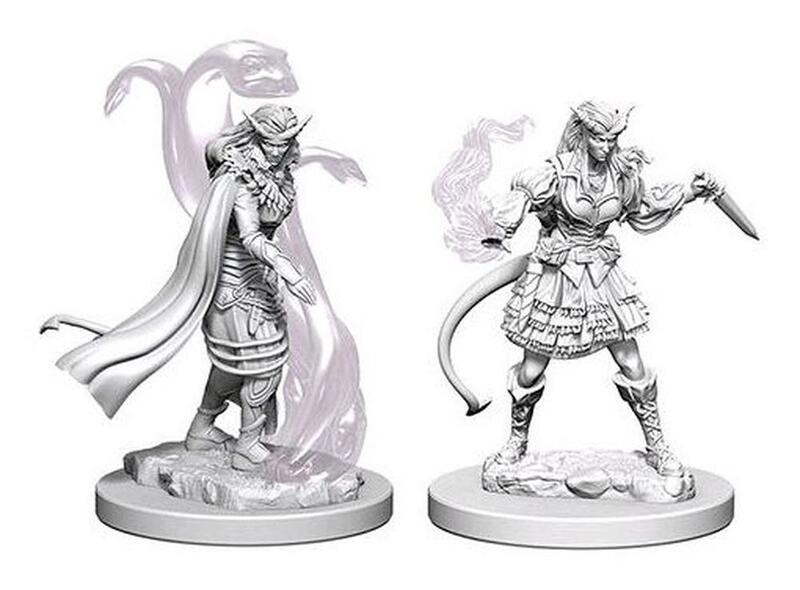 Enter the new Wizkids line of unpainted minis. One of the new players had rolled a Tiefling Warlock. I have always wanted to paint a Tiefling but never found a suitable miniature before. Well, no more excuses now. Out of the two miniatures, I got drawn to the one with translucent snakes emanating from the base. There would surely be lots of room for experimentation on those. But first things first: the miniatures come unpainted and pre-primed with Vallejo white primer, but they still need some moldline removal. After that’s done, I gave them a generous coat of black wash to make sure I could see all the details and plan how I wanted to paint them. Much better. I don’t like the fact that the face lacks definition, but other than that, the details are pretty crisp. The back of the cloak is a pain to get to when you are painting, but that is going to be mostly obscured anyways. And most of the miniature is going to be eclipsed by the amazing translucent snakes, so… the paintjob really isn’t that important. Her patron being the Raven queen, I had to make her cloak black. It also looks quite good against the red skin. The blue clothes and brass details also came out quite good, but the orange “skirt”… I don’t know. I certainly did not want it to “pop” that much. I need to get a higher variety of oranges, especially muted ones (or learn to mix my paints better). But all of that is minor… where are the snakes? Now THAT’s more like it! These were accomplished by thinly spreading heavily diluted washes over the surface. They tend to pool quite a bit, so I just kept playing with them, spreading and taking there where I wanted them to be, in order to get a smooth coverage. It took quite a bit of time, but eventually the resultwas quite good. Some minor details later (I can’t believe I forgot to paint the horns! ), and it was done. The very last touch was a coat of Gloss Varnish over the snakes, after the whole miniature had been varnished with matte spray.